Well, happy May Day a day late! 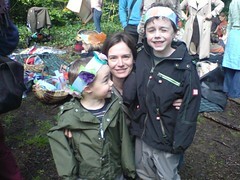 This morning there was no school, but rather a festival at the Queen's Wood for all of us. The children all had special flower crowns to wear, and some children arrived with their own made out of real flowers. The girls all looked like little wood nymphs and pixies, quite adorable. Then in good Waldorf fashion we all took our turns dancing around the May Pole to live cello and flute melodies. I couldn't decide if I had arrived back in the Renaissance era or to some free lovin' hippie fest. Either way, it was all good.